Alteration of cortical actin structures is the common final pathway leading to podocyte foot process effacement and proteinuria. The molecular mechanisms that safeguard podocyte foot process architecture and maintain the three-dimensional actin network remain elusive. Here, we demonstrate that neuronal Wiskott-Aldrich syndrome protein (N-WASP), which promotes actin nucleation, is required to stabilize podocyte foot processes. 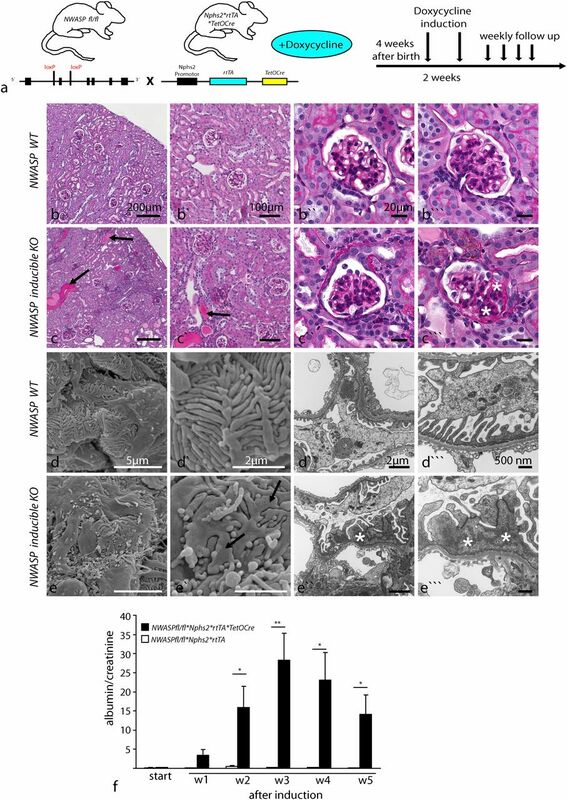 Mice lacking N-WASP specifically in podocytes were born with normal kidney function but developed significant proteinuria 3 weeks after birth, suggesting an important role for N-WASP in maintaining foot processes. In addition, inducing deletion of N-WASP in adult mice resulted in severe proteinuria and kidney failure. Electron microscopy showed an accumulation of electron-dense patches of actin and strikingly altered morphology of podocyte foot processes. 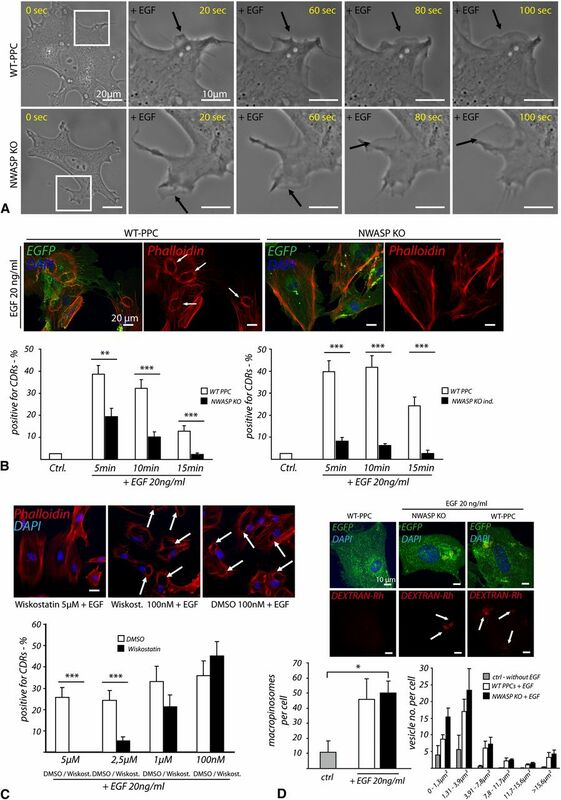 Although basic actin-based processes such as cell migration were not affected, primary cultures of N-WASP–deficient podocytes revealed significant impairment of dynamic actin reorganization events, including the formation of circular dorsal ruffles. Taken together, our findings suggest that N-WASP–mediated actin nucleation of branched microfilament networks is specifically required for the maintenance of foot processes, presumably sustaining the mechanical resistance of the filtration barrier. Podocytes are highly specialized, polarized, and postmitotic epithelial cells that form a complex network of interdigitating foot processes (FPs).1 These structures are required to establish a tight glomerular filtration barrier and rely on an elaborate three-dimensional actin architecture.2,3 Studies using transgenic mouse models and insight from genetic studies in human glomerular diseases have led to the unifying concept that alterations in the actin cytoskeleton of podocytes lead to impaired filtration properties and clinically overt proteinuria.4–6 On the basis of previous observations, it is assumed that a complex system of cortical actin might be responsible for the stabilization of podocyte FPs.7 Actin related protein 2/3 complex (Arp2/3)–mediated actin branching/nucleation might represent one mechanism in providing required complexity of interconnected actin filaments.1,8 This process is modulated by a large group of nucleation promoting factors, including the ubiquitously expressed neuronal Wiskott-Aldrich syndrome protein (N-WASP).9 The use of transgenic mouse models has recently allowed researchers to study and dissect the precise in vivo role of N-WASP in a tissue type specific context.10 These studies indicate that constitutive deletion of N-WASP leads to embryonic lethality,11 whereas conditional knockout (KO) models present with variable phenotypes.12–16 Due to its conformational composition N-WASP is usually present in an autoinhibited state, while several signaling cues, including small GTPases, promote the activated form of N-WASP.17 In addition, previous studies have suggested a regulatory pathway for the podocyte FP actin cytoskeleton involving interactions between the podocyte specific slit diaphragm molecule Nephrin and the adaptor molecules noncatalytic region of tyrosine kinase adaptor protein ½ (Nck1/2).18 However, it remained unclear to which extent the mechanism of actin branching contributes to the construction of the actin architecture of FPs. We therefore utilized N-WASP podocyte specific knockout mice indicating that actin nucleation promoting factor N-WASP is a prerequisite of podocyte maintenance and FP stabilization. Immunofluorescence staining and confocal microscopy identified that N-WASP, ARP2, and CORTACTIN were highly enriched in podocyte FPs, suggesting an exquisite role of actin branching in these highly specialized cellular processes (Figure 1, A`–A````, and Supplemental Figure 1, A, C, E, G–I). Immunogold labeling with an antibody against N-WASP was performed to resolve the subcellular localization of N-WASP. Positive immunogold particles were observed in primary as well as secondary processes in close proximity to individual actin filaments (Figure 1, B–D). Subcortical actin structures of FPs were decorated with N-WASP immunogold positive particles (Figure 1C), suggesting a condensed actin branching machinery in this subcellular compartment. To test the functional relevance of the actin nucleation/branching machinery in FPs, we generated a podocyte-specific N-WASP knockout model (Figure 1, E and F). Absence of N-WASP protein was also observed using confocal microscopy (Supplemental Figure 1, A and B), while the typical podocyte marker NEPHRIN, the ARP2 subunit and CORTACTIN were unaffected in their localization pattern (Supplemental Figure 1, C–F). Efficiency of early deletion of N-WASP was confirmed by confocal immunofluorescence microscopy analysis of P2 and P7 tissue (Supplemental Figure 2, A–D). Although mice were born at a normal Mendelian ratio and without any obvious phenotype at birth, respective knockout mice developed a severe growth retardation (Figure 1G), with first significant differences detectable at the age of 6 weeks after birth. An increase of proteinuria in N-WASP knockout mice was observed at the age of 3 weeks (Figure 1H), which was further augmented over the follow-up period of 3 months. Finally, podocyte failure due to the loss of N-WASP resulted in ESRD and lethality (Figure 1I). The actin nucleation machinery is highly enriched in podocyte FPs and conditional deletion of N-WASP in podocytes results in severe proteinuria and early lethality. (A`–A````) Confocal images of human glomeruli stained with specific antibodies against N-WASP and Nephrin; cytoplasmic accumulation is indicated by white arrow, and colocalization of Nephrin and N-WASP in close proximity to the glomerular capillary is marked by a white asterisk. (B) Immunogold labeling with an antibody against N-WASP reveals presence of N-WASP in primary as well as secondary FPs (black arrowheads). (C and D) N-WASP–positive gold particles are present in cortical actin bundles (arrowheads) and also in actin patches in primary FPs (asterisks). (E) Schematic representation of generation of N-WASPfl/fl*Nphs2Cre mice. 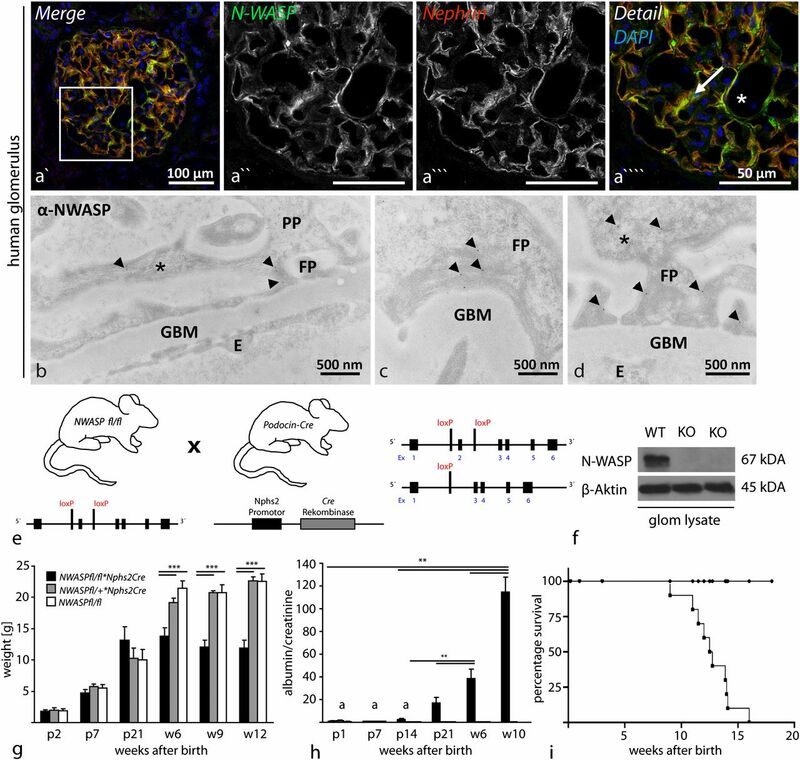 (F) Efficiency of N-WASP deletion is confirmed by Western blotting on glomerular lysates from wild-type and N-WASPfl/fl*Nphs2Cre mice aged 3 weeks. (G) Follow-up on body weight gain in respective WT, heterozygote, and homozygous N-WASPfl/fl*Nphs2Cre animals. (H) Proteinuria is present at 3 weeks after birth. (I) Increased mortality is observed in respective knockout animals. **P <0.01; ***P<0.001. PP, primary foot process; FP, secondary foot process; GBM, glomerular basement membrane; E, endothelium; WT, wild-type; a, no difference. Corresponding to the functional data, no significant histologic differences between knockout and wild-type animals were detectable within the first weeks of life (Supplemental Figure 3, A and B). However, at the age of 9 weeks, dilated tubuli with proteinaceous casts and severe glomerular scarring were present (Supplemental Figure 3, C–F). These findings were associated with a significant accumulation of DESMIN in the mesangial compartment of the glomerulus (Supplemental Figure 3, G and H). Podocyte slit diaphragm proteins NEPHRIN, PODOCIN, and SYNAPTOPODIN exhibited a similar localization pattern in N-WASP KO compared with WT controls at 3 weeks of age (Supplemental Figure 4, A–D). Typical epithelial junctional proteins like ZO-1 were not affected by N-WASP deletion (data not shown). Electron microscopy (EM) studies were utilized to analyze ultrastructural composition and structure in FPs of wild-type and mutant podocytes. Whereas comparison of 1-week-old animals showed no major abnormalities (Figure 2, A and B), differences were observed at the age of 3 weeks after birth (Figure 2, C and D). Interestingly, accumulations of electron-dense actin clusters were present, which localized in a band-like configuration in close proximity to the glomerular basement membrane (Figure 2D). Higher magnifications showed that regular actin filaments were extending from these electron-dense actin patches, indicating that the process of regular actin polymerization appears to be intact in N-WASP KO mice (Figure 2G). Because conventional EM uses chemical fixation that only slowly penetrates tissues and might affect actin structure appearance, we performed high-pressure freeze EM techniques allowing the cryo-immobilization of native tissue structures without prior fixation.19 Using high-pressure freeze techniques, irregular morphology of podocyte FPs could be observed (Figure 2, H and I) and first actin condensations were detectable (Figure 2 I`) already at 2 weeks after birth, suggesting that the lack of N-WASP results in a failure to maintain regular branched actin microfilament arrays in podocyte FPs. Actin cluster accumulation accompanies N-WASP deletion in podocytes. (A–D) Knockout and wild-type kidneys are analyzed by scanning EM and transmission EM. Podocyte morphology and FP development exhibit no major differences at 1 week in podocytes from N-WASP fl/fl*Nphs2Cre mice compared with respective controls (slit diaphragms are indicated by white arrows in A and B). (C and D) At 3 weeks of age, significant ultrastructural alterations are detectable, including numerous microvillus extensions on the surface of podocytes in N-WASP KO animals (scanning EM shown in D; black arrows); furthermore electron-dense, belt like structures in close proximity to the GBM are present in effaced FPs of KO animals (white asterisks in D`` and D```). At higher magnifications, these electron-dense patches are identified as clumped actin accumulations (D``` and D````). (E) Further detailed views display almost detached podocytes, scarcely connected via thinned primary processes to the GBM. (G) Regular actin filaments extend from condensed actin patches in effaced secondary processes (black arrows indicate actin filaments, white asterisks mark actin patches). (H and I) Cryo-EM reveals actin condensations in respective KO mice (black arrows mark slit diaphragm region and white asterisks indicate actin condensations) already at 2 weeks of age. To further dissect the effect of N-Wasp deletion in podocytes, we established a primary podocyte culture system (Supplemental Figure 5, A–F). Diverse cellular processes rely on effective actin nucleation/branching, lamellipodia formation, and migration, among others.9 Interestingly, we did not observe any differences in the response to epidermal growth factor (EGF) between wild-type and mutant primary podocytes in terms of lamellipodia initiation and formation (Figure 3A). These data are in agreement with our in vivo observations in which initial FP formation was unaffected in N-WASP podocyte-specific knockout mice and no developmental phenotype was observed (Figures 1 and 2). Nevertheless, single cell migration assays and velocity tracking revealed a slight increase in migrational speed of mutant podocytes, whereas focal adhesion pattern and size appeared not to be altered (Supplemental Figure 5, G, H, and J). These results are in line with previous reports about lamellipodia formation in MEFs from N-Wasp KO mice11 and point to a specific function of N-WASP–mediated actin branching. In addition to propagation of lamellipodia formation, growth factor stimulation can exert dynamic remodeling of dorsal actin structures, which are classified as circular dorsal ruffles (CDRs).20 Stimulation of wild-type primary podocytes with EGF triggered the formation of CDRs in the majority of cells (Figure 3B), whereas CDR number was significantly decreased in mutant podocytes (Figure 3B). Similar observations were made when wild-type primary podocytes were pretreated with the N-WASP inhibitor wiskostatin (Figure 3C). Further analysis of CDR diameters revealed that formed actin rings in mutant podocytes were smaller in size, indicating impaired actin dynamics and stability of formed networks (Supplemental Figure 6, A and B). Although the exact physiologic function of CDRs is still unclear,20 they can serve as a model to assess dynamic and transient changes in the actin cytoskeleton. Interestingly, it was also reported that loss of the adaptor molecules NCK1/2 results in decreased formation of circular dorsal ruffles.21 Because it was proposed that CDRs might be involved in fluid phase uptake processes and macropinocytosis, we performed dextran uptake assays with mutant and wild-type primary podocytes from N-WASP KO mice. A clear response upon EGF stimulation was detected in both cell types, however there were no differences in the amount of dextran uptake (Figure 3D). The impairment of N-WASP KO primary podocytes to form robust CDRs might therefore reflect the observed in vivo phenotype, because similar dynamic actin branching processes are probably required to stabilize FPs under physiologic conditions. CDR formation is impaired in primary N-WASP KO podocytes. (A) Live cell imaging of N-WASP KO induced and wild-type podocytes. Upon application of EGF (20 ng/ml), wild-type and KO cells form lamellipodial protrusions (black arrows). (B) Staining with phalloidin detects CDRs after stimulation with EGF (white arrows indicate CDRs). Quantification of CDR-positive cells after stimulation with EGF shows that N-WASP KO podocytes (Nphs2*Cre and Nphs2*rtTA*TetOCre induced cells) exhibit a diminished capacity to form CDRs compared with wild-type control cells. (C) Pretreatment with the N-WASP inhibitor wiskostatin also results in impaired dorsal ruffle formation in primary podocytes (white arrows indicate CDR formation). (D) Macropinocytosis assessed by dextran uptake shows no major difference between wild-type and KO cells (white arrows indicate dextran-positive macropinosomes). Assessment of macropinosome number per cell shows no difference between wild-type and mutant podocytes. In addition, size distribution of respective vesicles indicates a clear response in wild-type and KO podocytes upon EGF stimulation. **P<0.01; ***P<0.001. To finally test our hypothesis that N-WASP is required for maintenance and stabilization of podocyte FPs rather than for FP development, we generated a podocyte-specific inducible knockout model (Figure 4A). To test the efficiency of the inducible knockout system, a reporter allele was intercrossed. Successful recombination was confirmed by the selective expression of enhanced green fluorescent protein (EGFP). Using a previously described induction protocol recombination efficiencies between 60% and 70% were achieved (Supplemental Figure 6C).22 Respective control and mutant mice were analyzed at defined time points and significant proteinuria was detected right after completion of the induction protocol and remained constantly elevated compared with control animals over the observational period of 5 weeks (Figure 4F). 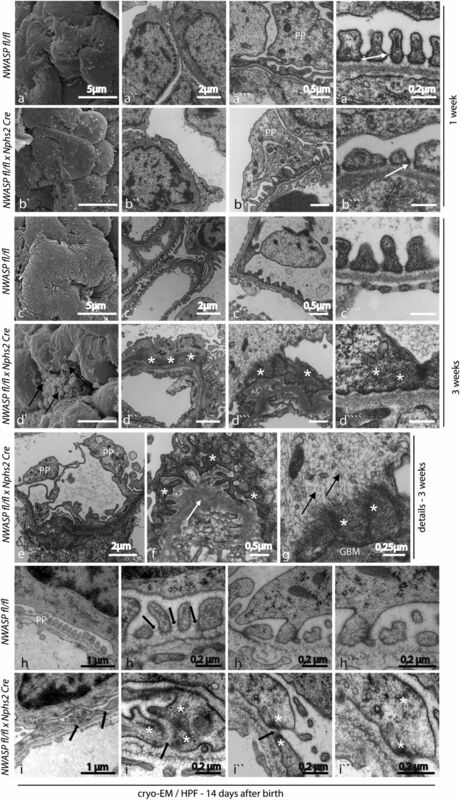 Histologic analysis exhibited proteinaceous casts in dilated tubuli and focal scarring of glomeruli (Figure 4, B and C). EM revealed FP effacement in respective knockout animals (Figure 4, D and E), as well as prominent electron-dense actin cluster formation in FPs (Figure 4, D``` and E```). These observations were very similar to the phenotypic presentation using the constitutive hNphs2-Cre system, underlining the role of N-WASP in regulating the maintenance of podocyte FPs. As in other systems, a compensation of WASP (hematopoietic form) for N-WASP was reported, we tested whether this mechanism also occurs in podocytes.10,11 Interestingly, there was no upregulation of WASP (mRNA and protein level) in glomeruli from N-WASP KO mice (Supplemental Figure 7). N-WASP is required for the maintenance of podocyte FPs. (A) Schematic illustration of generation of N-WASPfl/fl*Nphs2rtTA*TetOCre mice. Timeline illustrates the induction protocol: 4 weeks after birth, doxycycline is applied for a 2-week period and urine is collected every week. (B and C) Five-week postinduction periodic acid–Schiff staining shows signs of proteinuria in N-WASPfl/fl*Nphs2rtTA*TetOCre mice (black arrows in C` indicate proteinaceous casts). A subset of glomeruli shows first signs of segmental scarring (white asterisk in C```). (D and E) Ultrastructural analysis detects FP effacement (black arrows) and actin condensations in effaced podocyte FPs (white asterisks) of N-WASPfl/fl*Nphs2rtTA*TetOCre animals (5 weeks after induction). (F) Measurement of proteinuria after completion of doxycycline induction shows first detectable increase after 1 week and further increase over the observational period. *P<0.05; **P<0.001. Here we demonstrate that N-WASP is required for the maintenance of podocyte FPs. Previous work has suggested that efficient actin nucleation/branching might be an essential mechanism in constructing and maintaining the structure of FPs.1,18,23 A fundamental role was attributed to the trimolecular complex consisting of Nephrin/Nck/N-Wasp.18 Strikingly, the observed phenotype of N-WASPfl/fl*Nphs2Cre mice is different from reported potential upstream regulators of actin branching such as Nephrin, Nck, and Cdc42.18,24,25 Although deletion of these genes presents with congenital/early onset proteinuria and fused podocyte FPs at birth (thereby pointing to a role in early development of podocytes), deletion of N-WASP in podocytes shows a rather delayed phenotype. The discrepancy in the observed phenotypes possibly results from the multiple functions in different cellular compartments of these molecules: The phenotype of Nephrin deficiency appears to be dominated by the loss of the slit diaphragm.24 Total loss of both Nck isoforms might not only affect actin regulation, but may also modulate various other functions of tyrosine kinase signaling in podocytes.26 Interestingly, only very recently a non-canonical pathway (independent of Arp2/3) mediating actin stabilization at the zonula adherens in epithelial cells was reported for N-WASP.27 Whether this mechanism also plays a role for podocyte foot process stabilization needs to be investigated in the future. In summary, N-WASP is specifically required to stabilize actin networks in mature podocytes. This suggests a particular importance of N-WASP–mediated actin nucleation of branched microfilament arrays for the mechanical maintenance of FPs and the filtration barrier. N-WASP fl/fl conditional mice (SV-129 background) were a kind gift of S. Snapper, (Department of Gastroenterology, Harvard University, Boston, MA).11 To generate a podocyte-specific KO, N-WASP fl/l mice were intercrossed with Nphs2-cre mice (generously provided by L. Holzmann, University of Pennsylvania School of Medicine, Philadelphia, PA), which will be further referred to as N-WASP fl/fl*hNphs2-cre. Inducible knockout mice were generated by intercrossing N-WASP fl/l mice with hNphs2-rtTA*TetOCre mice (generously provided by S. Quaggin, Samuel Lunenfeld Research Institute, Mount Sinai Hospital, University of Toronto, Toronto, Canada). For isolation of primary podocytes, a reporter strain was established using Gt(ROSA)26Sortm4(ACTB-tdTomato,-EGFP)Luo/J (purchased from JAX), resulting in N-WASP fl/l*Nphs2Cre;tomato<EGFPfl/+ mice. All animal studies were approved by the Committee on Research Animal Care, Regierungspräsidium Freiburg. Evaluation of proteinuria (expressed as the albumin to creatinine ratio) was performed as previously described.22 Collection of urine samples was performed at defined time points as indicated. Mouse-specific albumin (Mikrofluoral Mikroalbumin Test; Progene) and creatinine kits (Creatinine PAP LT-SYS; Labor&Technik, Eberhard Lehmann GmbH) were used according to the manufacturers’ instructions. Isolation of glomeruli using magnetic bead perfusion (Dynabead) was performed as previously described.22 Glomeruli from 3-week-old mice were glass-glass homogenized in lysis buffer (containing 20 mM CHAPS and 1% Triton X-100) and centrifuged at 15,000×g for 15 minutes at 4°C. Protein concentrations were assessed by detergent compatible protein quantification assays (Bio-Rad) and equal amounts of protein were applied for SDS-PAGE experiments.22 The following antibodies were used: N-WASP (rabbit, 4848; Cell Signaling), WASP (rabbit, 4860; Cell Signaling), and β-actin (mouse mAb AC15; Sigma). Immunofluorescence staining was performed as previously described.22 In brief, cryosections from snap-frozen tissue samples (embedded in optimal cutting temperature compound) were fixated with PFA 4% for 2 minutes, subsequently treated with NH4CL (50 mM) and blocked with 5% BSA in PBS. Further staining procedures were performed using the following primary antibodies: anti-N-WASP rabbit mAB (4848) (Cell Signaling); N-WASP anti-rabbit pAb (HPA005750) (Atlas Antibodies); anti-podocin rabbit pAb (P03721) and anti-Arp2 mouse mAb (A6104) (Sigma-Aldrich); anti-Nephrin guinea pig pAb (GP-N2) and anti-Synaptopodin mouse mAb (65194) (Progene); anti-CD31 rat mAb (550274) (BD Biosciences); anti-Desmin mouse mAb (Clone D33) (Dako); anti-ZO1 mouse IgG1 and anti-E-Cadherin mouse IgG1 (Invitrogen); and anti-P-Cadherin mouse IgG1 (Thermo Scientific). Appropriate secondary antibodies were respective Alexa-488, Alexa-555 conjugated fluorophores in a final dilution of 1:500 (all purchased from Invitrogen). Isolation of primary podocytes was performed adapted from Rastaldi et al.29 To genetically label podocytes in a cell-specific way, conditional mouse lines were crossed to a well established reporter mouse strain.30 Expression of Cre-recombinase results in selective activation of EGFP in respective cell populations. Results are presented as mean ± SEM, unless otherwise specified. To test for statistical significance of observed effects, either a two-tailed t test or one-way ANOVA (including postanalysis utilizing Newman–Keuls algorithm) was used. P<0.05 represented statistically significant differences. We thank Betina Kiefer (Renal Division, University Hospital Freiburg) for excellent technical assistance. We thank all members of our laboratory for their support and helpful discussions, especially Björn Hartleben and Wibke Bechtel. We are grateful to L. Holzmann for providing hNphs2-Cre mice and to S. Quaggin for the Nphs2-rtTA-TetOCre mouse model. This work is supported by grants from Deutsche Forschungsgemeinschaft (DFG), Bundesministerium für Bildung und Forschung (BMBF) Gerontosys II - NephAge (031 5896A) and the Else Kröner Foundation to T.B.H., as well as by the Excellence Initiative of the German Federal and State Governments (EXC 294) and the Excellence Initiative of the German Research Foundation (GSC-4, Spemann Graduate School). This work was done in partial fulfilment of the requirements of the thesis of C.S. This article contains supplemental material online at http://jasn.asnjournals.org/lookup/suppl/doi:10.1681/ASN.2012080844/-/DCSupplemental.